Jamie Saracino of Apollo Beach makes sure son Jackie, 5, is ready to roll on his dirt bike at the motocross raceway near East Bay Raceway Park in Gibsonton where children of all ages can train and practice throughout the week and on weekends. GIBSONTON — You are a single mom. You have a high-energy son in preschool. How do you get him away from the games on the ubiquitous cell phone? How do you get him away from the TV? How do you get him productive and interested in school? How do you get him outside the house — safely? If these questions sound familiar, it’s because the same or similar dilemmas exist for many parents … and because there are no easy answers. For Jamie Saracino, the answer came in the form of the carrot and stick approach, although it is much more carrot than stick. The single mom, who works in an area emergency room as a nurse practitioner, remembers that when he was 4 years old, her son Jack got it in his head that he wanted to ride dirt bikes. “I don’t know where Jack got that idea,” says Jamie now. “The loud and fast vehicles, the possibility of injury, and the dirt — not so much on the track — but on his clothes and body! “The more I went to the track and watched and talked with people there, the more scared about this for Jack I became. “Jack was adamant about wanting a dirt bike,” recalls Jamie. “I didn’t know what to do. But Jack was not exactly thriving in preschool, especially with the discipline. “So I sat down with him and we agreed if he was good and his behavior improved in preschool, I would get him a dirt bike,” says Jamie. December came. Jack liked the carrot idea and was straightening up and flying right in kindergarten. Next came a mini dirt bike and a visit to the track with a trainer, Jack and a ride on the bike. He skidded out of control the first time up in the parking area. And on the track went Jack with Mom’s anxiety level up but a promise is a promise, a carrot a carrot, and Jack’s demeanor in and out of preschool was much improved. No stick was necessary. Thus started the Saracino’s “dirt bike life” almost a year ago. 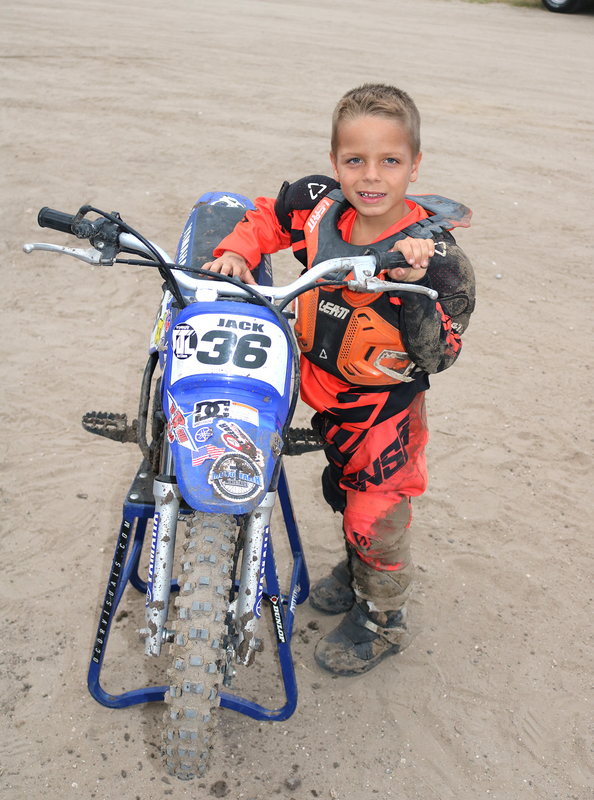 Jack Saracino, now in kindergarten in Apollo Beach, and his mom Jamie are just two of the “dirt bike regulars” at the Tampa MotoCross track adjacent to the East Bay Raceway Park on old U.S. 41 north of Gibsonton. The Tampa MX concluded its current bike season last weekend with the Dealer’s Cup. Jack has been racing his tiny 50PW, a Yamaha Pee Wee, and was in second place seeking the overall trophy in the Dealer Cup. He has added a Cobra 50 to his stable of dirt bikes and is sponsored by Barney’s. Jack’s older neighbors in Apollo Beach, teenagers Johnny Butler and Mason Ryder, have also been bitten by the dirt bike bug and, like Jack, will continue through the winter practicing, training, and racing at the track. The undulating and meandering dirt track behind a spectators’ fence is managed and maintained by Zack Freeberg and Mike Floyd on Tuesdays, Wednesdays and weekends for participants of all ages, some 4-wheelers but 95 percent on bikes. 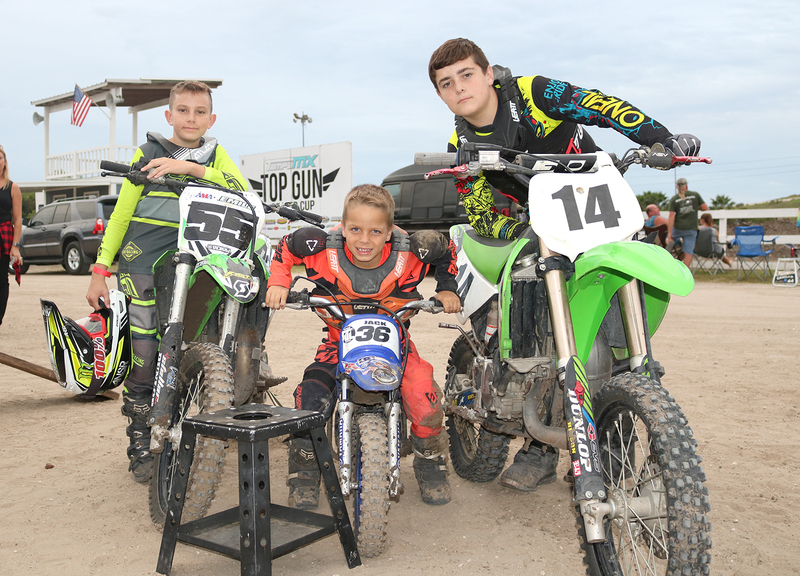 Young dirt bike racers from Apollo Beach getting ready for the motocross track in Gibsonton: Curves, jumps, dust and all. From left, Johnny Butler, Jackie Saracino and Mason Ryder. Jamie bubbles with excitement at the fun and spirit she and her son, Jack, have discovered over the past year. “The dirt bike sport is time-consuming and takes money and physical dedication,” she says.”However, with the help of Jack’s aunt Cindy and the other track families who come out for practices and races, it’s a great sport. “Jack eats and breathes dirt bikes. He even dreams about dirt bikes. “On race days, it’s awesome,” remarks Jamie. “In this sport you get to meet a lot of people, and everyone is supportive and family-oriented.